How many wedding receptions have you suffered through where you've been starving and have had to choke down a plate of rubber chicken, yet you told the bride and groom the food was delicious? The days of cookie-cutter plated dinners and lukewarm buffets are over. Enter the food station, a way to create a unique dining experience your guests will remember for years. “Food stations are good for personalizing because you can take the food stations and turn them into vignettes of yourself,” says Alexa Lemley of Columbus, Indiana-based Artisan Foodworks catering. Lemley says couples can create food stations around their personal history. For example, if you met in Chicago, you could create a Chicago-style hot dog station. “You can share elements of your romantic story in food,” says Lemley. “It becomes interactive. That's another appeal,” says Selma Owens, owner of Lexington-based Selma's Catering. She adds that food stations can encourage conversation among guests and create camaraderie, particularly if the station is more interactive, such as a carving station or fresh pasta station. It also means that your guests don't have to enviously eye other tables that get served or asked to go to the buffet first. “Guests don’t have to wait for food, they can just start having fun. A lot of times people start eating so we can start having fun,” Owens says. Guests choosing love choosing from multiple food stations, but it’s important to have staff at the stations who are vigilant about keeping foods neat and tidy. Lemley explains that if you have a mashed potato bar or a salad station, toppings can get mixed. “If a bride and groom work with a caterer, a caterer will always make sure food separation will happen,” she says. Figuring out how many food stations you’ll need certainly takes planning. For a wedding with 150 guests, Lemley suggests having two types of meats and a salad station, keeping in mind that each station is like a mini buffet. Although food stations can be a hit with your guests, they also inflate your budget if you’re not careful. Some stations, such as a carving station or fresh pasta bar, require extra staff. “Not all of them are attended, but a lot of them are like that,” Owens says. Additionally, each station requires its own plates and silverware. The more stations you have, the more you'll need to budget for china, silverware and staff to transport and clean it. 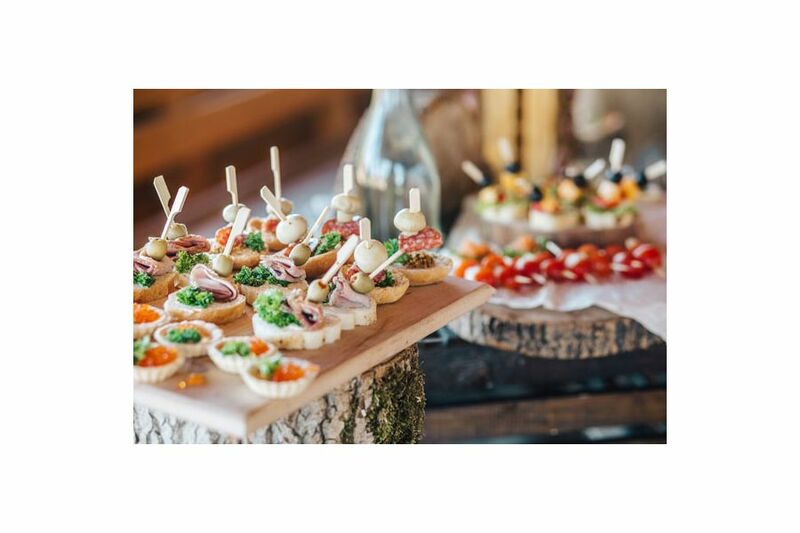 Still, an evening of food stations can be a hit with your guests and allow you to cater to a variety of palates for the entire evening, for appetizers, the main course, dessert and after-dinner snack stations. “It’s like a choose-your-own-adventure kind of deal,” Lemley says.